Tag Archives for " Liz O’Neil Dennison "
It’s guest post day here at Duct Tape Marketing and today’s guest post is from Liz O’Neil Dennison – Enjoy! You’ve probably heard that a content audit is essential for driving engagement and revenue with content. But what is it, exactly? Why do you need one? And how do you do begin to tackle such a laborious task? A content audit is a qualitative analysis of all the content your company has ever published online. It exposes where your content actually lives, how it’s performing, and where the thematic gaps are. Before you can audit your content, you need to create a content inventory, a comprehensive list of the name, location, and description of each asset published by your brand. If you don’t know what content you have, and how it’s performing, you can’t improve. The key to driving more leads, traffic and revenue through your content marketing is by identifying holes in your content deliverables. With the content audit, you can understand which buyer personas and buying stages are poorly resourced, find and share content internally, access historical performance data, and identify what content should be archived or removed entirely. Despite the clear values of the content audit, very few marketers actually conduct one. That’s because auditing content is a notoriously painful process. It can take weeks, or even months, to find, analyze, and document each asset your company has ever published online. But it doesn’t have to. Before analyzing your content, you need a comprehensive list of it. Perform an inventory of all of your content across all of your brand domains, including social. If you’re going about this manually, document the name, URL, and description of each content asset in a spreadsheet. If you have a significant body of content to manage, you’re better off just typing your brand URLs into a tool like The Content Auditor, which will automate this inventory process for you. Get the most out of your audit by understanding what content categories are most important, both internally and externally. Your audit should provide a map of those attributes across your entire content library so you can see where the holes are. Include these categories in your excel spreadsheet and tag each asset appropriately or, if you’re using an automated tool, scroll through your online inventory to tag content. When you’ve tagged all of your assets, you’ll end up with a pretty cool content map. You’ll be able to see which personas, buying stages, and themes you’re serving with content, and where you need to step up. Sift through your content map and identify where the holes are. Then, brainstorm easy ways you can fill those gaps. Perhaps there’s a whitepaper or eBook you can repurpose to serve a different audience. Or you can plan to ramp up your social promotion to feed the top of your sales funnel. What content is performing well, and what isn’t? Your audit should include key content KPIs so you can see what themes, content types, and messages are resonating with your target audience. Track metrics like social shares, traffic, leads, and revenue. And align your findings around four key areas: production, engagement, performance, and content scoring. This way, you can make informed decisions about future content marketing efforts. Once you map your content through your audit, present your findings in a coherent way. Don’t just include the data from your audit. Suggest what that data means for your company’s future marketing strategy. Expose the content holes in your major themes, personas, and buying stages. Suggest how you’ll fill these gaps by repurposing existing content, archiving or removing irrelevant content, and producing more of the kinds of content that have proved successful. Propose new processes to support these changes. You can’t know where you’re going until you know where you are. 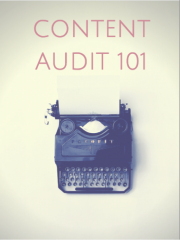 And with tools like The Content Auditor, marketers no longer have an excuse for avoiding what Rebecca Lieb calls “the cornerstone of content strategy.” What you don’t know can kill you. Stop living in the dark, and get auditing.